Winters in the mountains is the most amazing time of the year. As the dust of the summers settle down and the temperature plummets, the incoming snowfall transforms the landscape from golden brown to pristine white. It ends a cycle of life to give way to the new beginnings of new year. As the roads to Spiti have seen significant improvement in the recent years, visiting Spiti in winters has become much easier. As the Spitians are opening their warm houses for guests the tourism during winters is on the rise. 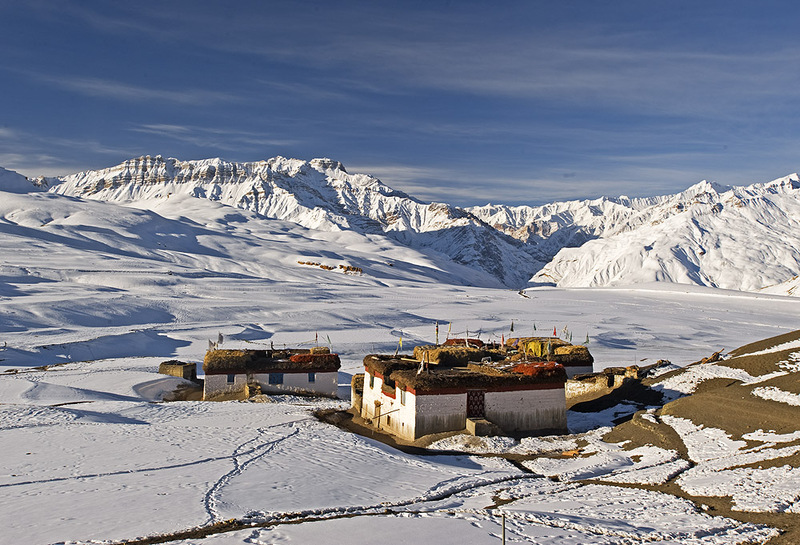 We bring you a great week long itinerary to show you the best of Spiti in winters. Be among the first few who explore the valley in winters with us. 4. Visit to highest post office (Hikkim) and highest village (Komic) with a motorable road in the world. Today is the day where we enter the Spiti Valley. The road from Kalpa initially descends to the Indo-Tibet Highway and continues on the left bank of Sutlej till Khab, the confluence of Spiti and Sutlej. We leave Sutlej behind and continue upstream of Spiti. Suddenly you can see the landscape has transformed with barren mountains all around. After an hour climb we reach Nako, another little village situated at an altitude of 3800m. The main attraction of this village is the artificial lake, which in the late spring is a sight to behold with pink flowers bloom all around the lake. After a brief stop at the lake we descend down to the river bed and continue upstream of Spiti crossing several villages – Chango, Shalkar, Sumdo, Hurling; before we enter the town of Tabo. Chos Khor Gompa is a 1020 year monastery located in the quaint village of Tabo. The monastery is one of the most ornately decorated depicting the life of the Buddha Pantheon covering its entire walls. You can spend enough time here talking to the monks trying to understand what a thangka painting is. Spend your day relaxing in the fields of Tabo or hike up to the caves, the monks used to meditate. Overnight stay at Tabo. Today we take the road to Kaza till we reach Sichling village, from here the road winds up to the Dhangkar monastery, which was once the capital of Spiti, under King’s rule. Dhang means cliff and kar means fort, the fort situated on the edge of a cliff. Dhangkar Gompa or monastery is one of the architectural master pieces of the Buddhist yore. Built 800 years ago this is one of the endangered archaeological sites in the world. Experience the old world feeling of the Dhangkar monastery. An hour and half hike takes you the beautiful Dhankar lake, relax and click as many photos on the shores of this beautiful lake before heading back to the village. From Dhangkar we drive towards one of the little know villages of Spiti, Lhalung. With Snow capped peaks in the background and the cultivation fields built on the slope of the mountain Lhalung is a photographer’s charm. Golden Temple or the Serkhong Gompa is another 1020 year old monastery adorning this little village. High on Himalayas is the theme of the day. We leave Kaza and immediately gain altitude as we head towards the village of Komic – the highest village in the world with a motorable road at a height of 4580m. Tangyud Gompa (Monastery) is the jewel of the place. The old and new monastery shows the devout Buddhist beliefs of the locals. We retrace the path towards Hikkim, situated at 4440m this village boasts the presence of Highest Post Office in the World. Send postcards to your family and friends from here. The road continuously meanders above 4400m till you reach the village of Langza, with the Snow Capped peaks jutting out in front of you in every corner leaving you breathless with its sheer magnitude. Langza, the most scenic village of Spiti, situated under the shadows of 6303m peak called Mt. Chau Chau Khang Nilda and adorned by the large statue of Buddha. After a great Spitian winter experience we start our journey back to the cities but not without a final blast. We retrace the roads back to Kinnaur via Tabo, Nako till Powari. Here we climb up towards Recong Peo-the headquarters of Kinnaur and continue higher to the little village of Kalpa. Kalpa offers magnificent view of Kinner Kailash range from up close and across the valley. Several iconic images have been captured from the main market of the village. Note: Most hotels will be closed in Spiti during winters, only homestays will be available. At other places we will provide you hotels. We will provide you heated rooms at Homestays in Spiti and at hotels in other places. Note 1: The itinerary is subject to favorable weather and road conditions. 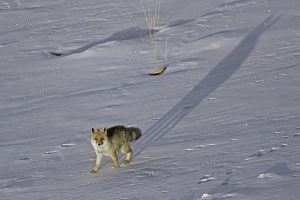 In case of a bad weather and inaccessibility to certain destinations we will try our best to make alternate plans. The tour price will not be refunded in the event of unfavorable conditions. Note 2: The temperatures in Spiti Valley dip up to -20°C in winters. We advise the clients to buy suitable clothing and gear for winters. People of Spiti live in this place throughout the year without expensive warm wear so there is nothing to be afraid of. The homestays are well insulated with a traditional/electric heater in the rooms. The homestays will have dry compost toilets in winter.